Travelers don’t have to head to big national parks to find outdoor adventures. More small towns are developing places for biking, climbing, kayaking and more, says Jonah Ogles, senior editor with Outside magazine. “These are places where people are really happy to live, and are willing to donate their time, money or energy to make things happen” like trails, parks and races. The publication ranks top adventure towns in its September issue, and Ogles shares some of his favorites with Larry Bleiberg for USA TODAY. 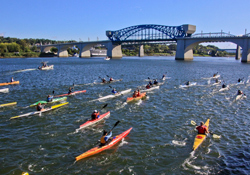 Chattanooga became the darling of urban planners back in the 1990s, when it redeveloped its pedestrian-friendly downtown, centered on a new aquarium. Decades later, the area has only gotten cooler with a rock-climbers’ hostel, whitewater rafting courses, and biking along the Tennessee River. “This is one of the rising stars of the South,” Ogles says. View online or view as PDF.